Having earlier looked at Arsenal’s shot charts, we’ll move on to the team that currently sits in second place in the league – Man City. Having scored a whopping 54 goals (49 as shown above, 2 penalties and received the benefit of 3 Own Goals) in their opening 19 games I’ll not win any prizes for originality when I suggest that Man City have been the best attacking team in the league. But I’ll suggest that regardless. 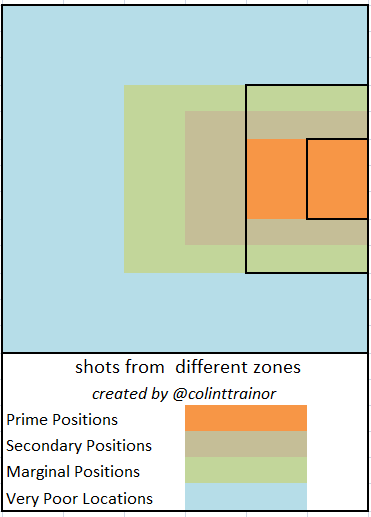 Their 160 shots from Prime Positions is virtually 2 full shots per game (37 in total) better than Arsenal who chase them in this measure. When a team can combine having the shots with the highest average goal expectation with being the team that shoots most often in the league then they are a serious offensive team – this is exactly the feat achieved by Man City this season. Defensively, City have conceded the fewest shots (190) in the league, but they are nowhere near as tight as Arsenal when it comes to where the shots are allowed to come from. 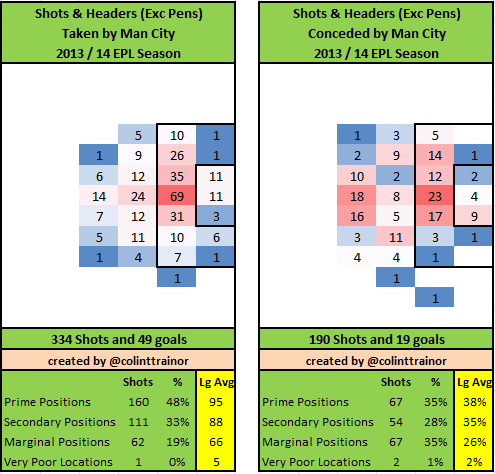 Man City’s openness has meant that 35% of the shots they allow are from Prime locations; Arsenal as shown earlier allowed just 27%. However, the 160 Prime shots they have taken means that they join Arsenal as the only two Premier league teams with a ratio of more than 2 for Prime Shots For : Conceded. These are elite numbers as only two other teams have a ratio higher than just 1.50. As much to contrast the under performance of Giroud that I set out in the Arsenal article, here are the shooting curves this season for Man City’s two main goal threats – Sergio Agüero and Álvaro Negredo. 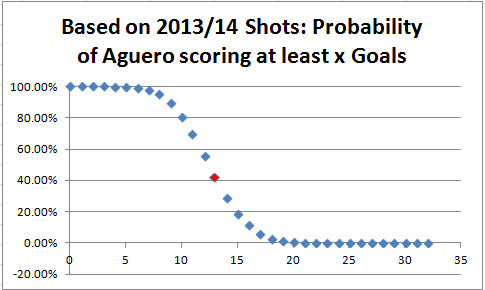 Aguero’s goal total of 13 (as denoted by the red dot) intercepts the vertical axis at 41%, and as this is below 50% this demonstrates that the Argentine has converted his chances better than our model expected him to. In just 41% of simulations did he score at least 13 goals given the shots that he attempted. 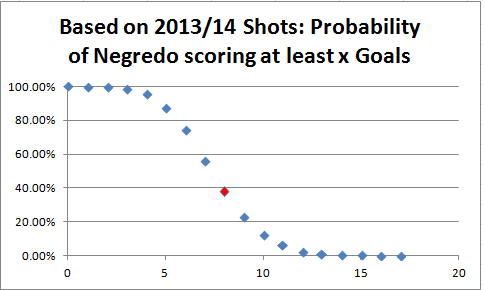 He’s not alone though as Negredo has produced a similar shot finishing performance so far this season. The finishing of both strikers firmly put Giroud’s lack of scoring prowess into context.